Haemangioma is also popularly known as birthmarks or cavernous haemangioma and/or strawberry naevus affects approximately one in ten infants. The male-to-female ratio is 1:4. A higher incidence is found in premature babies and those who were subject to chorionic villous sampling in utero. In addition, haemangioma is more common in white-skinned babies or twin babies (multiple births) or in those with advanced maternal age and/or family history of infantile haemangioma. Over 80% of infantile haemangiomas occur in the head-and-neck region. They usually develop shortly after birth and grow most rapidly over the first 6 months and may keep growing for up to 12–18 months. After that, it undergoes regression or involution, and 50% of all infantile haemangiomas have completed involution by the age of 5 years, 70% by the age of 7 years and 90% by the age of 9–12 years. However, in a small percentage of patients in whom haemangioma disappear completely, residual fatty tissue or superficial skin telangiectasias (small, widened blood vessels on the skin) remains; these patients may require treatment during childhood and if not treated, then this haemangioma may turn to a hard, blackish permanent tumour. Conventional treatment of haemangioma consists of laser therapy, drug therapy: to slow the growth and decrease the size of the lesion. These can be topical, injectable, oral or intravenous: propranolol, timolol, steroids, vincristine. Surgery may be required for painful and ulcerated non-healing haemangiomas, lesions interfering with breathing, vision or other vital functions; haemangioma that does not completely involute; and unacceptable scarring or deformity. Homoeopathy has also a role to play in the treatment of haemangioma. Homoeopathy can quickly, safely and effectively dissolute them with its effective internal medicines and constitutional approach. Tall claims, need to revisit either remove or reframe. There are about forty possible medicines for haemangioma in Homoeopathy, and those that are most commonly used medicines in cases of haemangioma are Acetic acid, Aesculus hip, Apis mel, Arnica mont, Ars alb, Aurum mur, Baryta mur, Bryonia alba, Calcarea carb, Calcarea flour, Carcinosin, Causticum, Flouric acid, Graphites, Hamemelis, Hepar sulph, Hypericum, Lachesis, Lycopodium, Millefolium, Nat sulph, Nitric acid, Nux vom, Phosphorus, Plumbum met, Pulsatilla, Secale cor, Silicea, Sulphur, Thiocinaminum, Thuja, Vipera, etc. In the following cases, Vancouver Scar Scale (VSS) was used for the assessment [Table 1]. 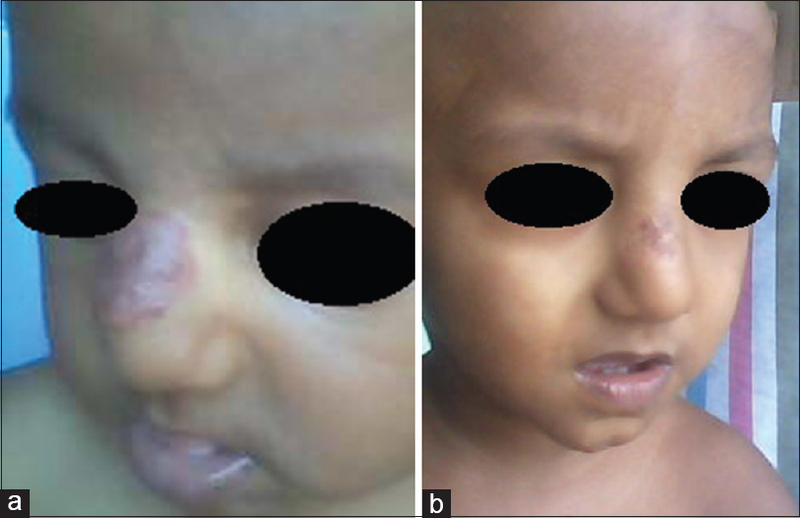 A 5-month-old male child presented with a large, firm, reddish, vascular tumour on the nose [Figure 1]a. At birth, the tumour was not observed, but within a month, reddish discolouration appeared on the nose. Gradually, it increased in size and looked like a soft reddish, bloody cap and gradually became firm. The child's mother consulted a paediatrician who advised her to drain the blood through surgical procedure at the age of 3 months, but she did not follow. Umbilicus enlarged and increased more in size during crying. Tendency to easily catch cold. The baseline assessment of the patient was done according to the Vancouver Scar Scale on the first visit and score was 9, and categorised as ‘severe’ [Table 2]. Based on the symptoms, repertorisation of this case was done according to the Kentian method. 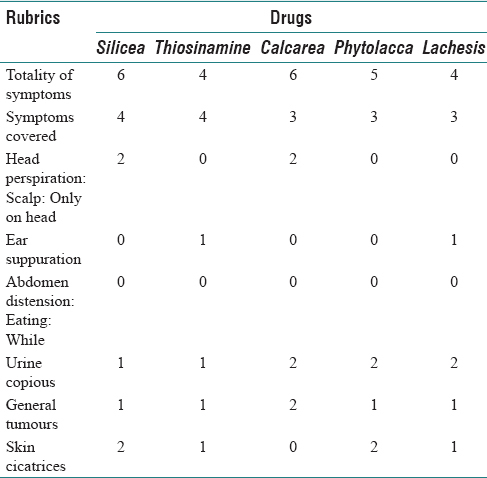 On repertorial analysis, both ‘Calcarea carb’ and ‘Calcarea flour’ covered most of the rubrics (4 out of 6), but Calcarea carb scored the highest marks (9), whereas ‘Calcarea flour’ scored next highest marks (8) [Table 3]. The Calcarea carb patient presents the guiding symptom of ‘Profuse sweat on the occiput, wetting the pillow’ and constitution as flabby muscles, large head, but the patient did not present with this type of symptoms and constitution. On the other hand, Calcarea flour is more effective in treating bloody tumour of newborns than Calcarea carb. Calcarea flour covers physical, general and particular symptoms and the same was compared in the Materia Medica by different authors. Hence, the most appropriate remedy selected for this case was ‘Calcarea flour'. Two doses of Calcarea flour in centesimal potency (1M) were administered to the patient at a time. One globule (poppy-seed size) of the medicine in 1M potency was dissolved in 10 ml of distilled water containing 0.2 ml (2% v/v) of dispensing alcohol, pre-mixed in it, followed by ten uniformly forceful downward strokes given against the bottom of the phial. This solution was given to the patient with the instructions regarding the dosage. Eventually, improvement was observed within 2 weeks of treatment and within 4 months, hiccough relieved, otorrhoea subsided as well as umbilicus restored to normal size. Medication was not repeated as long as the improvement in symptoms of the patient continued. When improvement was not commenced, the dose was repeated by gradually increasing the potency, i.e., power of the medicine such as 10M, 50M and CM step by step when required [Table 4]. After 10 months of the treatment, the haemangioma reduced considerably [Figure 1]b. In this case, the VSS score reduced from 9 to 1 in 10 months of follow-up and showed 88.8% improvement [Table 4]. This result shows the usefulness of the homoeopathic medicine Calcarea flour in treating haemangioma. The baseline assessment of the patient was done according to the VSS on the first visit and scored 9, and considered as severe [Table 5]. Based on the symptoms, repertorisation of of the case was done as per the Synthesis repertory. On repertorial analysis, ‘Silicea’ scored the highest marks (6) covering most of the rubrics (4 out of 6) [Table 6]. The physical, general and particular general symptomatologies were well covered by this remedy and compared according to Materia Medica by different authors. Hence, the most appropriate remedy for this case was ‘Silicea'. Sixteen doses of Silicea in fifty millesimal potencies (LM2) were administered. One globule (poppy-seed size) of the medicine in 0/1 potency was dissolved in 80 ml of distilled water containing 1.6 ml (2% v/v) of dispensing alcohol, premixed in it, followed by ten uniformly forceful downward strokes given against the bottom of the phial. This solution was given to the patient with the instructions regarding the dosage. Improvement was observed within 2 weeks of the treatment and within 3 months, otorrhoea subsided, sweat reduced as well as firmness of haemangioma slightly improved. The dose was repeated by gradually increasing the potency, 0/2, 0/3 and 0/4. However, after that, no improvement occurred. Therefore, after careful consideration of the symptom ‘Cicatrices (Scar Tissue)’ and based on the symptom according to repertory ‘Thiosinamine 0/1’ was prescribed. After prescribing this medicine, remarkable improvement occurred, and the dose was repeated by gradually increasing the potency, as 0/2, 0/3, 0/4, 0/5 and 0/6 step by step [Table 7]. Within 10 months of the treatment, the haemangioma reduced [Figure 2]b. In this case, the VSS score reduced from 9 to 0 in 10 months of follow-up and showed marked improvement [Table 7]. This result shows the utility of the homoeopathic medicine as well as fifty millesimal potency in the treatment haemangioma. There is no scarring, ulceration or infection resulting from homoeopathic therapy in this study. Much more time than usual was required only since the doses were not administered in a proper way as instructed. In these case reports, the patients showed improvement not only in the case of haemangioma but also in other associated complaints with the prescription of homoeopathic medicine. 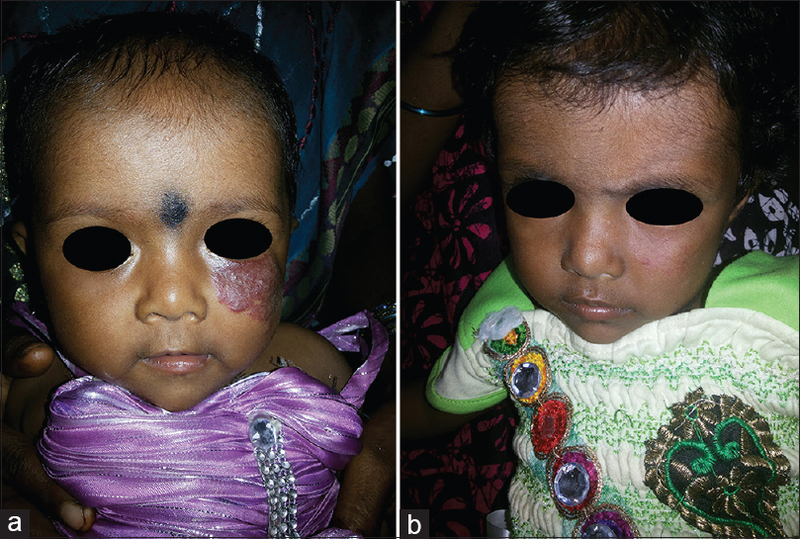 The results of these cases demonstrate that early treatment of infantile haemangioma with homoeopathic medicine can diminish the growth and hasten resolution without any side effects. Homoeopathic therapy shows positive results in the treatment of haemangioma, and these results need further validation by conducting clinical trials. The author is thankful to all the reviewers for reviewing and editing the article to encourage him for sharing experiences and developing knowledge in the field of research. Anonymus. Hemangioma. US National Library of Medicine. U.S. Department of Health and Human Services, National Institutes of Health. Available from: https://medlineplus.gov/ency/article/001459.htm. [Last accessed on 2016 Jun 07]. McGee P, Miller S, Black C, Hoey S. Propranolol for infantile haemangioma: A review of current dosing regime in a regional paediatric hospital. Ulster Med J 2013;82(1):16-20. Verrucous hemangioma. Available from: http://www.dermnetnz.org. [Last accessed on 2016 Jun 07]. Kent JT. Repertory of the Homoeopathic Materia Medica. 6th ed. New Delhi: B. Jain Publishers (Pvt) Ltd.; 2004. Master FJ. The Bedside Organon of Medicine. 2nd ed. New Delhi: B. Jain Publishers (Pvt) Ltd.; 2001. Adler UC, Adler MS. Hahnemann's experiments with 50 millesimal potencies: A further review of his casebooks. Homeopathy 2006;95(3):171-81.